Via our closing period Celebrating historic newspapers, we were notified of a special historic German newspaper collection in Namibia. The Sam-Cohen-Library is a reference library in Swakopmund, Namibia and situated next to the former Otavi Bahnhof, or railway station, which was the west coast terminal of the narrow gauge railway line to the copper mine at Tsumeb in the north. The building is being converted into a Transport Museum and an Arts and Craft Centre. The library, which initially started with only 5 books, today comprises some 10.000 volumes, which include the famous 2000-title Africana Collection of the late Ferdinand Stich. The library is a treasure chest for scholars, students and scientists alike. The archives, which belong to the Scientific Society Swakopmund are also housed in the Sam-Cohen-Library. 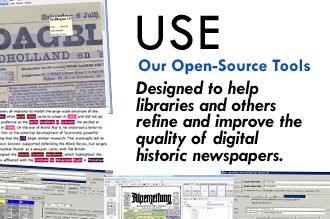 They grant visitors access to a unique collection of newspapers from 1898 to the present day. Also available is an extensive collection of historical photographs, maps and documents. The unique newspaper collection comprises 25 different titles. 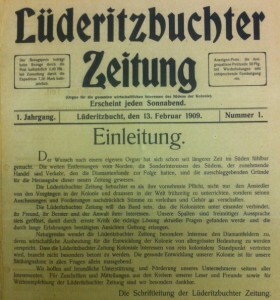 The earliest ones date back to 1898, such as the „Windhoeker Anzeiger“, that later on became the “Deutsch-Suedwestafrikanische Zeitung”, which in turn existed until 1914. Other titles like the “Allgemeine Zeitung” that was founded in 1919 or the “Namib Times” from 1958 are still running today. 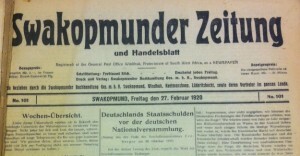 Most of the titles were in German, aiming to inform the German population in Southwestern Africa about the news from Namibia as well as from overseas and the home country. 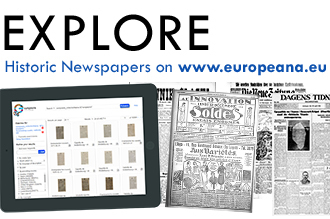 The newspapers typically consist of somewhere between four and twenty pages, with the “Allgemeine Zeitung” on average comprising 12-16 pages. One can say that there is a German newspaper culture in Namibia that goes back more than 100 years, while nowadays it has been reduced mainly to the occasional German article in English papers and the fully German-language “Allgemeine Zeitung”. 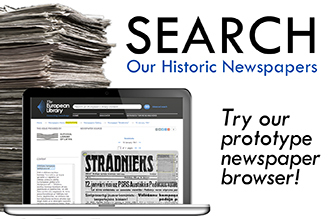 Our warm regards go out to Francois Hartz and the Scientific Society Swakopmund for making us aware of these historical newspaper treasures. 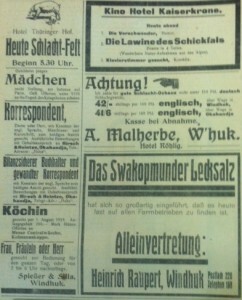 This entry was posted in Blog, Celebrating historic newspapers and tagged newspapers by eurnews. Bookmark the permalink. We have established a small company known as Ihlokohloko Group based in South Africa. Our objective is to start an independent small printing and publishing newspapers written in indigenous languages of South Africa. 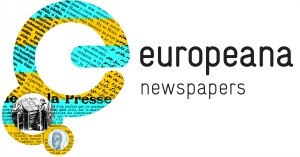 Now we would like to make a friendship with community German newspapers who strongly believe in culture and community rural journalism. Thanks, I hope you can find us such publications.